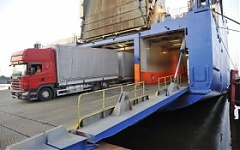 The turnover of ro-ro cargos at the Freeport of Ventspils rose by 13 percent in 2016, while the number of ferry passengers increased by 9%, the port's spokeswoman Inga Ievina told LETA. Ventspils Nafta Terminals, a stevedore of Latvia's Ventspils Nafta Group, handled 7.5 mln tons of oil products in 2016, down 18.5% from 2015, the company said. A Latvian expert on port operations, Raivis Veckagans has been appointed as the acting head of the Ukrainian Sea Ports Authority, the Ukrainian Ministry of Infrastructure announced. According to Statistics Estonia, in November 2016, domestic and foreign tourists who stayed in Estonian accommodation establishments numbered 216,000, which was 4% more than in November 2015. Various current and former European leaders and politicians have sent U.S. president elect Donald Trump a letter, warning about the true intention of Russian President Vladimir Putin and the consequences of lifting sanction, the Washington Post writes citing LETA/BNS. The registered unemployment in Latvia increased by 0.4 percentage points (ppt) in December 2016 to 8.4%, the State Employment Agency said LETA. ast year the unemployment rate in Estonia totaled 4.5%, which is 0.1 percentage points (ppt) more than in 2015, the Unemployment Insurance Fund said LETA/BNS.